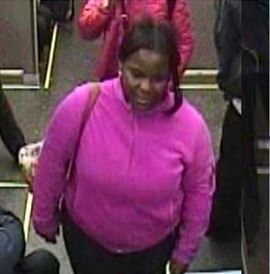 Area Central Detectives are seeking the public’s assistance regarding a Strong-Arm Robbery incident which occurred on October 26, 2016 at approximately 12:00 p.m. on the CTA Redline train at Clybourn. As the train was in motion, this female black approached the victim and tried to take her cell phone by force. When this female offender was unsuccessful in taking the victims cell phone, she then pulled the victim by the hair causing the victim to fall from her seat in an attempt to drag the victim from the train. The offender then fled at the Clybourn stop with two other female blacks and one female white.